To participate in the Saturday Snapshot meme post a photo that you (or a friend or family member) have taken. Photos can be old or new, and be of any subject as long as they are clean and appropriate for all eyes to see. How much detail you give in the caption is entirely up to you. Please don’t post random photos that you find online. A pathway on a trail at Champoeg State Park, outside of Newberg, Oregon. This is one my family's favorite state parks to visit. In September, on our anniversary, my husband and I took the kids there for a little hike and I was able to snap this picture. Looks almost like a secret pathway--with the way the greenery frames it. What a great trail to take a walk. I love shaded trails like this! Beautiful!! I'd love to visit!! What a great place for a hike. I always love pictures of paths going off into the distance--such possibilities of what you mind find on them! What a beautiful picture! And it sounds like we would get along great - we love the outdoors, state parks, and hiking with our kids. The first thing I thought of was The Secret Garden. I have heard that park is nice, but haven't been there before. Beautiful shot! 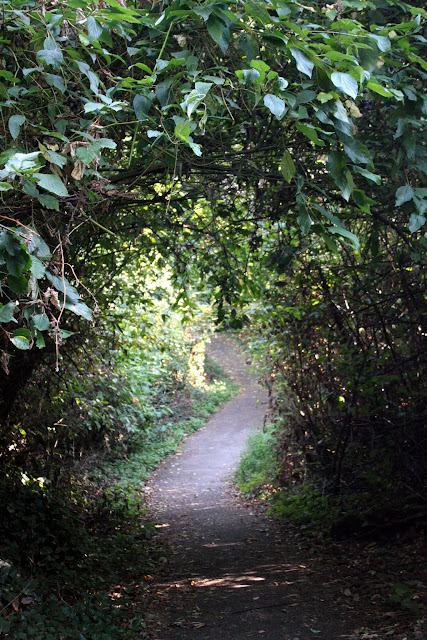 I love photos of paths - especially ones where you can't see the end. Mysterious feel to the photo.